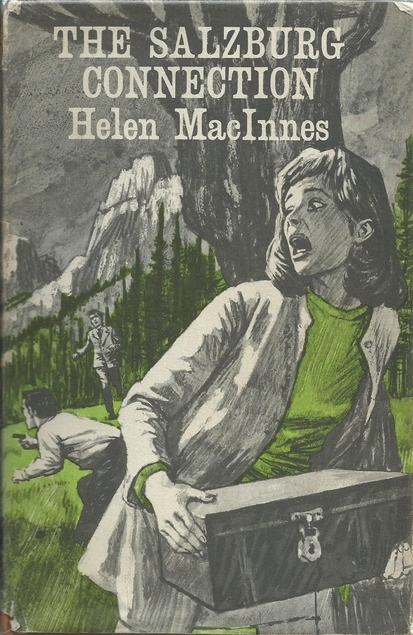 This entry was posted in Books and tagged espionage fiction, Helen MacInnes, Read Scotland 2017, Scottish author, The Salzburg Connection, thriller by Katrina. Bookmark the permalink. I read Assignment in Brittany last year but I didn’t know it was required reading for Allied Intelligence agents. What an interesting fact. I read many of her books years and years ago. I have been slowly making my way through them again. They are great spy novels, aren’t they? They are great spy novels. I’ve just discovered that Fife libraries have a lot of her books in stock although some are in reserve stock, which sometimes just means – lost! If I find any in secondhand bookshop I think I’ll buy them anyway. I’ve just organised to obtain a copy of this, sounds the sort of story I’d enjoy. I’ll let you know when I’ve read it. I’m fairly sure you’ll enjoy it, I certainly hope so anyway. How well I remember how much I enjoyed The Salzburg Connection. I read it in 1976-1977 at some point. I remember reading it with the squirrels munching on mulberries in the tree outside my second-story window in the apt. I shared with two other friends. My memory of the enjoyment is such that I’d like to read it again. I read several others by MacInnes, but I don’t remember which ones. Drat! I did keep a journal back then, so if I went back and scoured through boxes full or notebooks, I’m sure I’d know. I should do that some rainy, rainy day. We’re still raining, so maybe soon? It sounds like you and I must have been reading her books around about the same time. Unfortunately I didn’t keep any sort of track at all of the books that I read, but anyway it was all so long ago, I’ll never remember any of the details. Luckily Fife libraries seem to have a lot of her books. Love the cover. I have three of hers on the shelf! Me too, mine is in perfect condition, quite unusual because people used to just chuck them in the bin, it’s one of those book club books and they preferred the mock leather look of the actual book I think. The copy we used to have came with my wife. It was her copy from the book club she was in and yes, it was mock leather covers, which is why the dog had chewed it. The contents were just as good as when they left the printer’s. I well remember those books, the colours were so bright. My dad had them but I don’t know what happened to them when the family home was ‘cleared’. It’s strange that you hardly ever see them in secondhand bookshops. Maybe a lot of dogs were partial to them!